Give a Day to the City encourages people, organisations and business around Carlisle to get together and deliver volunteer-led projects in their community. 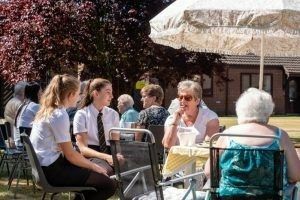 Organised by Carlisle Vineyard Church, it received two years funding totalling £9,698 from the Abbeyfield Carlisle Society Community First Fund to engage more with the local community. ‘Give a Day to the City’ started with 12 projects and 500 participants in 2015, growing to 32 projects and more than a 1,000 participants in 2017. In 2018, it took place during the first week of July and more than 1,000 people volunteered in 32 different projects across the city in ways that were new to most of them. More than 6,600 volunteer hours contributed to 32 projects including an outdoor decked seating area at Eden Valley Hospice, a purpose-built BBQ and new benches at John Street Hostel, a newly brightened entrance area with painted floor games at Carlisle Youth Zone and a newly tended allotment at Carlisle Carers. Many individuals have had life-enhancing experiences as a result of Give A Day. A Trinity School student, whose grandmother had died in Eden Valley Hospice, was keen to be involved. The school planned to allow students to attend for a half-day, however this student approached her Head of Year to secure permission to attend the project for a full day. She encouraged her grandfather to join her, and they purchased some plants to contribute to the project. Give a Day is also helping to forge longer-term partnerships across the city which will provide benefits to the wider community for more than a day or a week. An example is a local marketing business which offered its services free of charge to help the Rock Youth Project with re-branding, helping to increase its profile to service users and potential supporters. Give a Day is an annual event, visit the website for more details or to join a project.